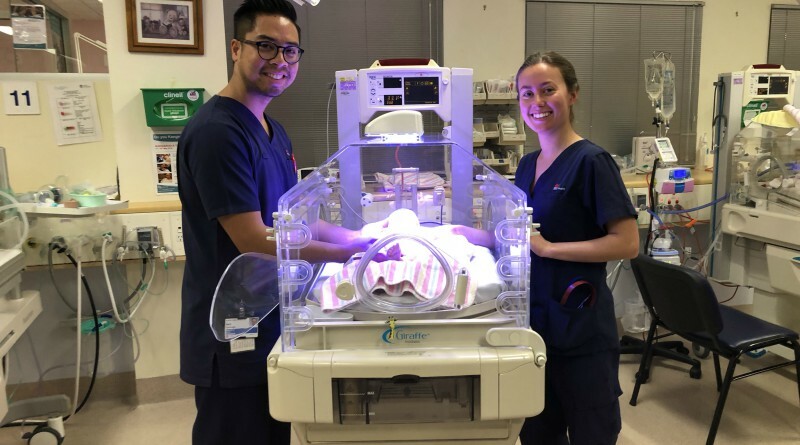 Blacktown Hospital newborn care nurses Neil Santiago and Maria Fernandez. A medical device to prevent jaundice in infants has been donated to Blacktown Hospital’s special care unit thanks to Solaris Paper and Kids West. Valued at over $5,500, the device is a phototherapy unit that projects a blue light to treat the yellowish skin caused by jaundice on newborn babies. Jaundice is the yellowish discolouration which can appear on the skin and the white area of the eye. If jaundice is not treated correctly, there can be devastating effects such as cerebral palsy, deafness and/or brain damage. Blacktown and Mount Druitt hospitals’ general manager Sue-Anne Redmond thanked Kids West and Solaris Paper for their generous donation to help the communities of Western Sydney. Left to right: Clinical nurse educator Jessica Casipit, neonatologist Kavita Bhola, acting nurse unit manager Ravinder Bhullar, general manager Sue-Anne Redmond, Kids West president Trevor Oldfield, ANZ and Solaris Paper manager David Cross, Kids West secretary JoAnn Oldfield, Solaris Paper head of sales Simon O’Donell and Kids West director Kevin Adamson. Kids West director Trevor Oldfield said Kids West has been supporting Blacktown Hospital for more than 25 years. “A huge thank you to Solaris Paper who have supported Kids West as their charity of choice for the second year and have made this donation possible,” Mr Oldfield said. “I believe it is important for companies to align themselves with local charities and form part of the broader community. Solaris Paper CEO Paul Tonkin said it was a pleasure to support Kids West and Blacktown Hospital. “We know this donation will go a long way in providing care to newborn babies in Western Sydney, where many of our team members at Solaris Paper call home,” Mr Tonkin said. Thank you to Kids West and Solaris Paper.